On 18 March 2019, C Heneghan and JK Aronson discussed the findings of the Heneghan et al systematic review “Oral hormone pregnancy tests and the risks of congenital malformations: a systematic review and meta-analysis”  at a meeting of an ad hoc expert group convened by the Medicines and Healthcare products Regulatory Agency (MHRA) in London. The meeting sought to assess the suitability and robustness of the methods used, including the selection and application of the quality scores and any clinical implications. Because we had inadequate time to respond to questions raised for the first time during the meeting, we have set out our detailed response to criticisms in this report. We also present a pooled analysis of data that were included in the report of the UK’s Commission on Human Medicines independent Expert Working Group (EWG) , based on data obtained through an FOI request. Of the 16 case-control studies, Heneghan et al did not include data for 40 participants from two studies in which there was the potential to select an alternative group for comparison. Therefore, 40 of 17,194 available items of patient data (0.23%) were not included in the analysis. in Greenberg 1977, 20 subjects were reported as having been exposed to hormones in both the case and control groups, and we considered it likely that these were exposed twins or family members. Of the 10 cohort studies, we did not include data from 3132 subjects from 4 studies in which an alternative group could have been selected for comparison. Therefore 3132 of the 55,974 items of patient data (5.61%) were not included in the analysis. in Torfs 1981, we excluded patients in whom serum tests (n = 689) or urine tests (n = 332) had been used; we included 17,057 non-affected controls. Thus, Heneghan et al used 95.7% (69,996/73,168) of the available control data. The main reasons for omitting the rest were non-use of hormones or other tests or, as set out in our protocol (computer dated 23 October 2018), we extracted data for the controls that were most closely matched to the cases. The exclusion of 4.33% of the control data had minimal impact on the effect estimate and does not remove the statistical significance. Confounding variables for matching were reported in 19 of the 26 studies (see Table 1. ). As we described in our paper, we consider that of the 16 case-control studies, 12 controlled for the most important factor (item 5a in the Newcastle-Ottawa Scale, NOS for non-randomized studies) and nine controlled for important additional factors (item 5b). Of the ten cohort studies, six controlled for the most important factor (item 5a) and four controlled for important additional factors (item 5b). Table 1 sets out the confounding variables collected and notes on matching/adjustments made in each individual study. “A further assessment of bias in studies of harms: a case study of Primodos and congenital malformations” is set out in BMJ EBM Spotlight * (published 15 March). This post discusses in detail the assessment of quality in assessing associations of harms and the use of the NOS. Gal et al. 1972: Excluding cases of previous malformed babies and those with a history of infertility did not affect the statistical significance: cases 15/85 vs control 4/97 (P = 0.01 to 0.001). Greenberg et al. 1977: After exclusion of all case-control pairs with a family history of congenital malformations in either or both families, use of HPTs by case mothers remained statistically significant: cases 64/743 vs control 35/781 (χ2 = 9.42; P < 0.01). Cases and controls were matched for all factors, except a history of previous offspring with abnormalities in the study families. After discussions of the APPG on 21 January 2019, Marie Lyon sent an FOI request to the MHRA on 30 January 2019, asking them to release the raw data from the EWG report (see exhibit 1); she wrote again on 4 February 2019. She received a response on 6 February: “the request will be forwarded to the appropriate department”. A copy of the FOI request was sent to IMMDS on 20 February. The issue of the availability of the raw data was raised by Lord Alton in the House of Lords on 28 February. On 5 March, the IMMDS emailed Marie Lyon to ask if the FOI request had been actioned. She confirmed that it had not. Marie Lyon sent a further request on 6 March: “Would you please let me know if the raw data I requested has been actioned yet.” She received a response from the MHRA on 8 March, but this did not include the attachment containing the raw data. On 8 March, she asked for the attachment and finally received the raw data on 11 March. We were interested in analysing these data, because we had noted a footnote in Figure 2 of the original EWG report, a forest plot of data on heart defects, which stated that “weights are from random effects analysis”, although neither weights nor pooled analyses were presented in the final report. Having received the raw data that had been extracted by the EWG, we now present the results of a random-effects meta-analysis. Analysis of the data presented in the EWG report shows a significant association of oral HPTs with a risk of congenital heart defects: OR = 1.92 (95% CI = 1.36 to 2.68; I2 = 22%; P = 0.0002; data from 9 case-control studies and 6 cohort studies). 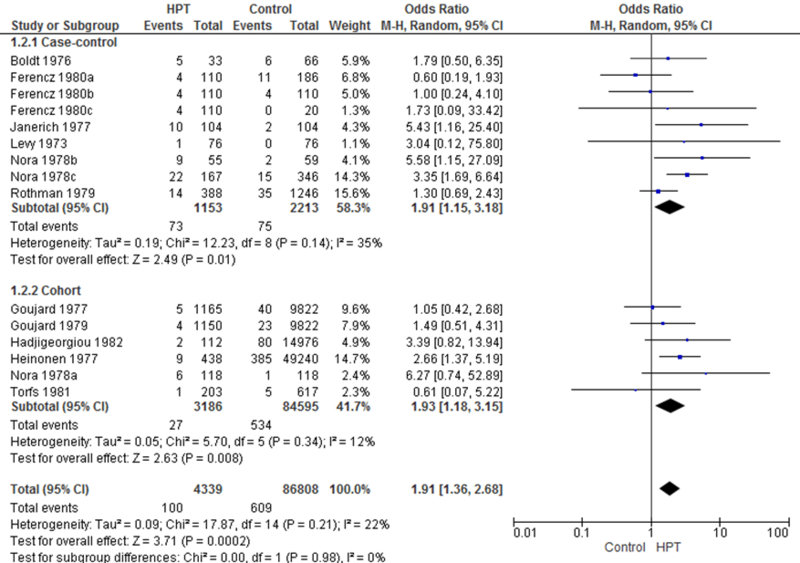 Analysis of the data presented in the EWG report shows a significant association of oral HPTs with a risk of any congenital malformation: OR = 1.34 (95% CI = 1.13 to 1.60; I2 = 0%; P = 0.0008; data from 4 case-control studies and 8 cohort studies). Analysis of the data presented in the EWG report shows a non-significant association of oral HPTs with a risk of urogenital defects: OR = 2.22 (95% CI = 0.82 to 6.02; I2 = 0%; P = 0.12; data from 2 cohort studies). Analysis of the data presented in the EWG report shows a significant association for congenital “other defects”; OR = 3.62 (95% CI = 1.11 to 11.82; data from 5 case-control studies). However, significant heterogeneity (I2 = 76%) across these 5 studies suggests that these results should not be combined; the term “other” probably reflects very different outcomes. The results of the meta-analysis of the data presented in the EWG review*  are similar to those found in the Heneghan et al systematic review . Both reviews show significant associations of HPTs with all congenital malformations and congenital heart defects, and a non-significant association with urogenital defects. The criteria for including studies differed between the two meta-analyses, as Heneghan et al focused the question solely on exposure to HPTs and excluded exposure to other hormones. 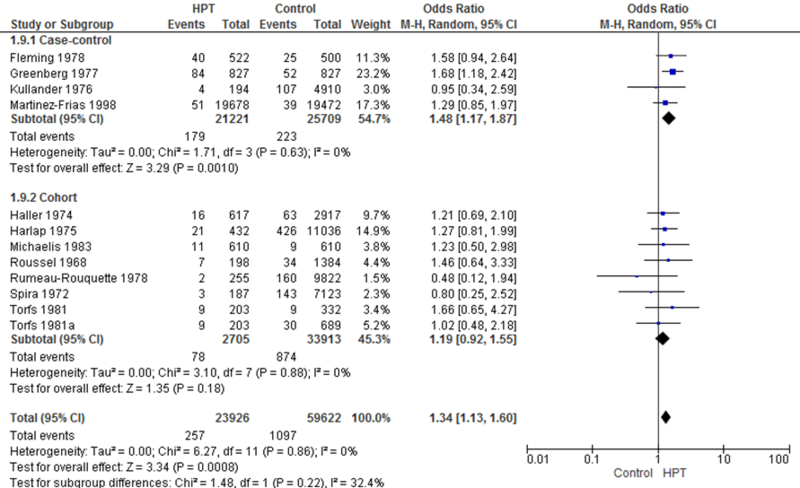 However, both systematic reviews show that the use of oral HPTs in pregnancy is associated with increased risks of congenital malformations (Table 2). Table 2. A comparison of analyses of the data presented in the EWG report and those presented by Heneghan et al. 1.66; P < 0.0001; I2 = 0%). Tümmler 2014: nervous system; urinary system; limb defects. JKA has published many review articles and original papers in peer-reviewed journals on adverse drug reactions; he has edited textbooks, for which he has received royalties; he has been remunerated for acting as an expert witness in cases involving suspected adverse drug reactions; he has presented the results of the systematic review discussed above to members of the Bundestag; he is a member of the Centre for Evidence-Based Medicine (see above). The views expressed are those of the authors and not necessarily those of the NIHR or the Department of Health and Social Care. Igho Onakpoya provided input to this letter and analysed the data using RevMan. Report of the Commission on Human Medicines’ Expert Working Group on Hormone Pregnancy Tests. GOV.UK. https://www.gov.uk/government/publications/report-of-the-commission-on-human-medicines-expert-working-group-on-hormone-pregnancy-tests (accessed March 2019).